We report a rare case of a hypernephroma that had metastasized to the sinonasal area as a solitary mass. Despite much difficulty, a confirmatory biopsy of the nasal mass was obtained. After radiotherapy hadfailed to arrest the tumor's growth, the mass was removed via a craniofacial resection. This case illustrates the importance of(1) a high index of suspicion in differentiating this rare tumor from other benign or malignant diseases, (2) awareness of the risk of hemorrhage and the role of preoperative embolization, (3) the need for paraffin histology rather than fine-needle aspiration or frozen section diagnosis, (4) individualizing therapy after due consideration of the characteristics of both the patient and the tumor, and (5) keeping abreast of the most current therapeutic modalities so that patient management can be individualized and optimized. Surgical excision offers the best hope for long-term survival, and it reduces the degree of pain, epistaxis, and disfigurement from the expanding tumor. When suc h tumors are not resectable, management with radiotherapy, hormonal therapy, immunotherapy, or chemotherapy can be considered. Several authors have reported that in patients with sinonasal metastases, the most common primary malignancy was hypernephroma, which accounted for approximately 50% of all cases. [1,5,6] According to Sgouras et al, sinonasal metastasis is sometimes the first or the only manifestation of a hypemephroma Awareness of this rare metastasis to the head and neck is important for several reasons: (1) it can easily be misdiagnosed as a benign cyst; (2) if it is unsuspected, severe hemorrhage at biopsy or resection can cause significant morbidity and mortality without preoperative embolization; (3) histologic interpretation can be difficult; and (4) surgical resection offers the best chance of cure of a solitary sinonasal metastasis. A 46-year-old man came to our clinic with a 3-week history of a lump on the dorsum of the right side of his nose. He had no other symptoms. Nineteen months earlier, he had undergone a nephrectomy and adrenalectomy for a 7.5-cm-diameter renal carcinoma. Histology at that time revealed a clear cell adenocarcinoma. The renal resection margin was clear of tumor. His adrenal gland was not involved. The nasal mass was 2 cm in diameter, painless, fluctuant, and not tender (figure 1). Flexible nasoendoscopy showed a smooth, vascular-looking lump arising above the right middle turbinate (figure 2). The rest of the ear, nose, throat, and neck was clear. Fine-needle aspiration obtained only blood. A careful punch biopsy attempted in the clinic was hampered by brisk epistaxis, which required Merocel nasal packing for 2 hours. The subsequent histology was inconclusive. Computed tomography of the paranasal sinuses detected a 4 x 2.8 x 1.8-cm soft tissue mass in the right anterior nasal cavity (figure 3). The lesion had eroded the nasal septum and had extended into to the left nasal cavity superiorly through both frontal recesses and the skin. 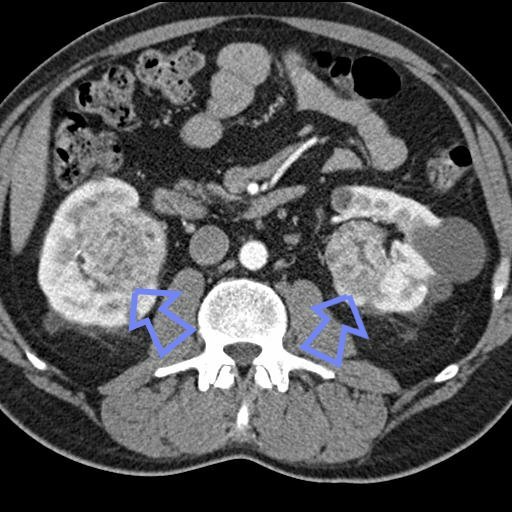 Considering the patient's medical history, we suspected a metastatic renal cell carcinoma. Preoperative angiography showed that the internal carotid artery had supplied 80% of the blood to the tumor and that the ethmoid branches of the ophthalmic artery had made a significant contribution. Embolization was performed to interrupt the 20% blood supply from the sphenopalatine branches of the external carotid artery. Two days after embolization, we performed an endoscopic excision biopsy of the tumor. During the biopsy, the patient experienced a 500-ml blood loss; hemostasis required a 15-ml Foley catheter balloon and a nasal cavity pack with bismuth iodoform petrolatum paste. Frozen section analysis was inconclusive, but paraffin section histology was consistent with a renal cell carcinoma metastasis. Bone scan, chest x-ray, and abdominal ultrasound did not reveal any other metastases. The patient underwent radiotherapy for the sinonasal metastasis, but it failed to halt the tumor's progression. Three months later, the growing tumor had breached the anterior skull base, but it remained extradural. The patient agreed to undergo a craniofacial resection following preoperative embolization (figure 4). Seven months postoperatively, he remained free of disease. The incidence of a renal cell carcinoma metastasizing to the head and neck has been reported to range from 15 to 30%. [8,9] However, it is rare ([sim]1%) to see only a single hypernephroma metastasize to the head or neck, as was the case with our patient. Route of spread. The hematogenous route is the most likely route of spread. [10,11] Two factors that support this belief are that the kidney is a very vascular organ and that desmosomes are reduced in renal carcinoma cells. Since our patient had no metastasis to the lung or liver, his disease had probably spread via the vertebral plexus and not the inferior vena cava. Diagnosis. It is important to remember that in some cases, there can be a long latency period between the appearance of a primary renal tumor and a metastasis. In a series of cases of metastatic carcinoma reported by McNichols et al, 11% of patients had first received treatment for their primary hypemephroma more than 10 years earlier. Moreover, a primary tumor is often asymptomatic, and only 10% of patients have the classic triad of costovertebral pain, abdominal mass, and hematuria. Therefore, a metastasis can be the first manifestation of a hypemephroma. With our patient's history of a renal carcinoma 19 months earlier, the first differential diagnosis we entertained was a secondary renal tumor. Metastases to other head and neck sites can be missed--either because they are so rare or because they can mimic benign diseases, such as hemorrhagic cysts and pyogenic granulomas on the gingiva, tonsils, tongue, and skin. On radiologic investigation, they can appear as cystic lesions in the mandible, temporal bone, neck nodes, and submandibular, parotid, and thyroid glands. [6,13] In the larynx, hypopharynx, and ear canal, they can mimic hemangiomas, angiofibromas, and inflammatory tissue. A high index of suspicion is required to avoid missing this malignancy. Before we could make a definitive diagnosis in our patient, we needed a paraffin section for histology. Frozen sections are often unreliable because they have difficulty distinguishing a renal carcinoma from an oncocytoma, an odontogenic tumor, and an acinic cell, thyroid, and lung carcinoma. 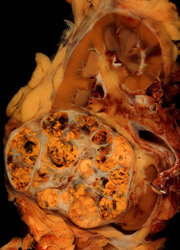 The histologic appearance of a renal cell carcinoma also varies according to its pathologic variants, the most common being a clear cell carcinoma (clear border of the cell, round or oval nuclei, and empty cytoplasm). Other variants include granular cell, sarcomatoid, and collecting duct types, although most have mixed features. Prognosis. The prognosis has been linked to the length of the primary tumor's latency period prior to metastasis. The 2-year survival for patients whose tumors have metastasized within 1 year is poor, although in rare cases of latency of more than 2 years, long-term survival in excess of 5 years has been observed. The prognosis is also better when the initial tumor measures less than 7 cm and weighs less than 500 g.
Treatment. The treatment of renal cell metastases is complex, and optimal management remains a challenge. Even though our patient's primary tumor measured 7.5 cm at its widest point and his latency period had been 19 months, we were careful not to condenm him to only palliative therapy. There were several good reasons to individualize therapy and treat this relatively young patient aggressively with craniofacial resection. First, the behavior of renal metastases is very unpredictable, ranging from highly aggressive to spontaneously regressive. [15,16] Second, patients in whom a solitary renal metastasis develops following treatment of the primary tumor have a better prognosis than those who initially present with metastatic disease; the median survival in the latter group has been reported to be only 1 year. [17,18] Third, although renal metastases are usually multiple, sinonasal metastases are usually single, and therefore surgery is probably the optimal treatment. Skinner et al  and Montie et al  reported that radical excision of a solitary metastasis (and nephrectomy when required) was associated with a 5-year survival in the range of 29 to 35%. Dineen et al later reported a 5-year survival of only 13% and a 2-year survival of 40%, and they noted that most of those patients had died of recurrences. Nevertheless, they wrote that radical excision still offers the best hope of long-term survival. When a tumor is not resectable, other therapies are available, including irradiation, hormonal therapy, chemotherapy, and immunotherapy. Irradiation and hormonal therapy have not been proven to be useful other than in making a small contribution as an adjuvant therapy. Chemotherapy with vinblastine, the fluoropyrimidines, and even the newer cytotoxics has not been as successful in treating renal carcinoma as it has been in treating other solid tumors. In a review of more than 70 agents administered to 4,500 renal cell carcinoma patients during phase II trials between 1983 and 1993, Yagoda et al reported that only 6.8% experienced an objective response, all of short duration. Chemotherapy is now generally reserved for patients who have failed immunotherapy and who are fit enough to tolerate it. Exciting new frontiers continue to be explored. Investigations of angiogenesis inhibitors and gene, monoclonal, and vaccine therapies are under way. (1.) Batsakis JG, McBurney TA. Metastatic neoplasms to the head and neck. Surg Gynecol Obstet 1971;133:673-7. (2.) Miyamoto R, Helmus C. Hypernephroma metastatic to the head and neck. Laryngoscope 1973;83:898-905. (3.) Bassil B, Dosoretz DE, Prout GR. Validation of the tumor, nodes and metastasis of renal cell carcinoma. J Urol 1985;134:450-4. (4.) Matsumoto Y, Yanagihara N. Renal clear cell carcinoma metastatic to the nose and paranasal sinuses. Laryngoscope 1982;92:1190-3. (5.) Bernstein JM, Montgomery WW, Balogh K. Metastatic tumors to the maxilla, nose, and paranasal sinuses. Laryngoscope 1966;76:621-50. (7.) Sgouras ND, Gamatsi IE, Porfyris EA, et al. An unusual presentation of a metastatic hypernephroma to the frontonasal region. Ann Plast Surg 1995;34:653-6. (8.) Boles R, Cerny J. Head and neck metastases from renal carcinomas. Mich Med 197l;70:616-8. (9.) Miyahara H, Umatani K, Senba O, et al. [Metastatic tumors to the head and neck region--6 cases and review of literature]. Nippon Jibiinkoka Gakkai Kaiho 1983;86:95l-7. (10.) Batson OV. The function of the vertebral veins and their role in the spread of metastasis. Ann Surg 1940;112:138. (11.) Nahum AM, Bailey BJ. Malignant tumors metastatic to the paranasal sinuses: Case report and review of the literature. Laryngoscope 1963;73:942-53. (12.) McNichols DW, Segura JW,DeWeerd JM. Renal cell carcinoma: Long-term survival and late recurrence. J Urol 1981;126:17-23. (13.) Batsakis JG. Metastatic neoplasms to and from the head and neck. In: Batsakis JG. Tumors of the Head and Neck: Clinical and Pathological Considerations. 2nd ed. Baltimore: Williams and Wilkins, 1979:240-51. (14.) Figlin RA. Renal cell carcinoma: Management of advanced disease. J Urol 1999;161:381-6. (15.) de Riese W, Goldenberg K, Allhoff E, et al. Metastatic renal cell carcinoma (RCC): Spontaneous regression, long-term survival and late recurrence. Int Urol Nephrol 1991;23:13-25. (16.) Johnson IJ, Campbell JB. Renal derived epistaxis. J Laryngol Otol 1993;107:144-5. (17.) Fyfe G, Fisher RI, Rosenberg SA, et al. Results of treatment of 255 patients with metastatic renal cell carcinoma who received high-dose recombinant interleukin-2 therapy. J Clin Oncol 1995;13:688-96. (18.) al-Kassab BM, Foster ME. Recurrent facial metastasis from renal-cell carcinoma: Review of the literature and case report. J Oral Maxillofac Surg 1995;53:74-7. (19.) Godley PA, Stinchcombe TE. Renal cell carcinoma. Curr Opin Oncol 1999;l1:213-7. (20.) Skinner DG, Colvin RB, Vermillion CD, et al. Diagnosis and management of renal cell carcinoma. A clinical and pathologic study of 309 cases. Cancer 1971;28:1165-77. (21.) Montie JE, Stewart BH, Straffon RA, et al. The role of adjunctive nephrectomy in patients with metastatic renal cell carcinoma. J Urol 1977;117:272-5. (22.) Dineen MK, Pastore RD, Emrich LJ, Huben RP. Results of surgical treatment of renal cell carcinoma with solitary metastasis. J Urol 1988;140:277-9. (23.) Yagoda A, Abi-Rached B, Petrylak D. Chemotherapy for advanced renal-cell carcinoma: 1983-1993. Semin Oncol 1995; 22:42-60. (24.) deKernion JB, Sarna G, Figlin R, et al. The treatment of renal cell carcinoma with human leukocyte alpha-interferon. J Urol 1983;130:1063-6. (25.) Quesada JR, Swanson DA, Gutterman JU. Phase II study of interferon alpha in metastatic renal-cell carcinoma: A progress report. J Clin Oncol 1985;3:1086-92. (26.) Wirth MP. Immunotherapy for metastatic renal cell carcinoma. Urol Clin North Am 1993;20:283-95. (27.) Fisher RI, Rosenberg SA, Sznol M, et al. High-dose aldesleukin in renal cell carcinoma: Long-term survival update. Cancer J Sci Am 1997;3(Suppl I):S70-2. COPYRIGHT 2001 Medquest Communications, Inc.